From its origins in the earliest stages of recorded history to the latest technical advances, we have always expected that medicine will make us well. The modern focus on new technologies and approaches has yielded impressive results. However, about 80 percent of the world’s population continues to use herbal and traditional medicines for their primary health care; and this practice is gaining acceptance as an alternate or complementary medicine system to modern medicinal science. Since the 1970s, scientific research is evaluating herbal ingredients for new drug formulations. It is no wonder that people are turning to herbal medicine to prevent illness and to alleviate pain. When we consider scientific progress in our last century, there are many examples of great strides in medicine for those who live in developed countries: antibiotics against many bacterial diseases; vaccines against many infectious diseases; the development of diagnostic tools, such as x-rays, magnetic resonance imaging; the development of treatments, such as heart transplants and chemotherapy, radio- and immunotherapies; and, the development of drugs, such as those for diabetes, contraception, psychosis and immunosuppression. Child and youth mortality decreased and life spans increased. We have experienced such progress that we expect it to continue. In other parts of the world, this progress is not part of everyday life. The doctor of Traditional Chinese Medicine (TCM) or doctor of Ayurveda or medicine man is the person most people still turn to for their health needs. Their knowledge of plants assists in a healthy birth; the treatment of a wound, a cold, a flu, an upset stomach, mental illness; or to treat chronic disease. The World Health Organization (WHO) describes herbal medicines as those plants used for protecting and restoring health from generation to generation in a culture or local community. Indians and Chinese have traditional herbal medicines that are now the basis of their Ayurveda and Traditional Chinese Medicine pharmacopeias. AIDS, lung cancer and diabetes, which are considered lifestyle diseases, are steadily increasing worldwide: AIDS is a pandemic affecting huge populations in Africa, and diabetes, unheard of in the Aboriginal population in Canada prior to the 1940s, is now considered of epidemic proportions in this community. A research program initiated more than 30 years ago by the U.S. National Cancer Institute screened medicinal plants and generally all biota for cancer, AIDS and other diseases. There are between 10–100 million organisms worldwide: Approximately 250,000 species are plants, of which 25-50 percent have traditionally been used for medicinal purposes. These play a major role in the discovery of leads for the development of drugs to treat human diseases. Since the 1970s, there has been a proliferation of health-product retailers and the availability of natural health products (NHPs) on grocery and drugstore shelves. These indicate growing consumer confidence in functional food and natural health products. According to Canadian Health Food Association, 71 percent of Canadians have used a NHP and as the population ages and there is an increased demand for preventative healthcare products, this consumption level will raise. The growth of the health-product industry has not been without its setbacks with incidents of mislabelled packaging, deaths associated with toxic metal contamination, and drug-tainted products. Because of safety concerns such as these, most developed nations, including Canada, regulate the natural health product industry. In Canada, as part of its regulation, product labels must provide not only the safety information but also usage information. Today, consumers have access to products used historically for healthcare in many countries and cultures; WHO has compiled a list of over 100 medicinal plants that are widely used in primary health care. The use of Herbal Medicines, once a narrow and specialized niche, is now entering the mainstream. Tradition has become intricately linked with western medicine, and new scientific discoveries will continue to shed light on ancient practices, to the advantage of both. Valerie Assinewe, PhD, learned about herbal medicines from her grandmothers, in her graduate studies, and in her jobs with the federal government and as a consultant. She is now a retired civil servant. In my previous blog, Collecting, I touched on the constraints that limit research of plants. Sometimes these are cultural or spiritual: many plants, especially those with medicinal applications, are sacred to indigenous peoples. For others, the restrictions may be ethical or legal in nature. These limitations affect scientists studying American ginseng, the subject of my own research from 1996-2001. That experience taught me a valuable lesson: in science, the process can be just as important as the findings. The indigenous habitat of American ginseng is eastern North America. In much of that area, federal, state and provincial jurisdictions have classified the plant as a species at risk. Ontario lists American ginseng as an “endangered species”, which means it is in danger of extinction. These designations have legal definitions and implications. The bottom line for “endangered species” is that any harvest of the plants in their natural environment jeopardizes the survival of the species. This creates a dilemma: to study, understand and ultimately protect a species, some careful scientific collection is essential. Because part of my research involved population analysis of American ginseng, I knew it would be necessary to collect and remove—and thus destroy—plants in the wild. My challenge was to find approaches to collection and research that would maximize the amount and value of information collected, while minimizing impact on the plant. How to reconcile those conflicting needs? One approach was to use samples that had already been collected. The scientific community has a large and active network and I was able to use those connections to get roots from generous colleagues from Canada and the U.S. And because of the popularity of America ginseng, a lucrative ginseng crop industry had developed, and I was able to use roots bought from a local grower for the immunopharmacological phase of my research. When I harvested the plant, it was at sites where the species was thriving and I collected the roots when the plant was in seed. Not only did the vibrant, fire-engine red seeds make the plant easy to find; it also allowed me to take those seeds and plant them in that area. Some naturalists would frown on this interference with nature; but to me it was a way to help ensure American ginseng survival and a proven stewardship method. My final mitigation strategy involved, ironically, the suppression of data. In population research, an important scientific fact is the precise location of each sample. But publicizing the location of an endangered species with a high market value meant exposing the species to harvest. For that reason, I avoided providing information in any public medium on the location of my collections. I could not in good conscience publish information that might further the demise of my plant. Scientific research is not just about increasing our understanding of the world around us, it’s also about defining our role in preserving it for others now and for the future. Indie plucks the rare specimen, Glorianus maximus, from its place of concealment high atop an Andean mountain after sighting it from his plane. Except it never happens like this. A successful botanical collection comes from the preparation. Here are a few tips from a 40-year veteran to get you started. What’s the life cycle – when does it flower, when does it seed? Wait for the plant to be at seed development before you collect if you are researching the seed. When is the best season for collecting? If the plant is a spring ephemeral then your collection period is limited to those two months in spring. Where is the plant found? Is it a forest plant: from a rainforest or deciduous? Is it a grassland plant: arid or semi-arid? What kind of soil does it grow on: sandy, clay? What other plants might it be found with? If the plant is shade loving, then look for it under forest canopy. Plants live in communities, so look for keystone species that may help you find your plant. How visible is it? If the plant is like others, then know the key differences. Are there cultural, ethical or legal collection restrictions? You will require permits to collect in parks and the permission of landowners to collect on private property. How can you find this stuff out? The good news is that all species in the plant kingdom have been identified and if the plant was used as a medicine then someone somewhere has recorded this information. The answers to your questions will be available in public-domain literature, e.g. ethnobotanical and ethnopharmacological journals and traditional references. If you are lucky, these resources are on the internet, otherwise plan time in the library. Some plants even have associations dedicated to them. You now have the morphology, ecology and traditional use of the plant. Are you ready to collect yet? Most of the references do not provide visual images so you have to use plant identification textbooks and databases. However, images in books, articles, or on a screen are just centimetres from your eyes. The plant is perfect and it is the only one in the illustration. You will require more than illustrations: The more pictures or paintings you see, the easier it will be to visualize the plant. Remember, the plant you are seeking is in its natural environment, so it may not look like the images. The plant is a food source to others, e.g. insects, fungi, and mammals; it may be damaged, and therefore its appearance could be altered. Also, the plant may not be upright because of the terrain or hidden because of other plants. With the imprint of your plant fixed firmly in your mind, pack your bag with mosquito repellent, cell phone, camera, GPS, specimen containers, trowel; put on the hiking boots; grab the walking stick and pepper-spray; and go. Glorianus maximus, look out! Two university girls. The open road. A car full of alcohol. The two girls were Shannon and me, on her collecting trip, when we were both doing our doctoral research summer of '98. She was working on Echinacea and I was working on Ginseng. Echinacea is indigenous to the Great Plains of North America. Amerindians have traditionally used Echinacea for wound and respiratory infections and today Echinacea products are used around the world to treat ailments of the immune and inflammatory response. The open road became for us the local roads in the Great Plains of the U.S. Shannon’s plan was to start her field research after conferring with an Echinacea taxonomy expert at the University of Kansas in Lawrence, Kansas. Then she planned to collect Echinacea in the mixed grassland; that is, the middle part the Great Plain, within walking distance of roads making our way from Kansas, through Nebraska, South Dakota and North Dakota on our way to Brandon, Manitoba. We were on the road by mid-July. It was a good time to collect because this plant was flowering. 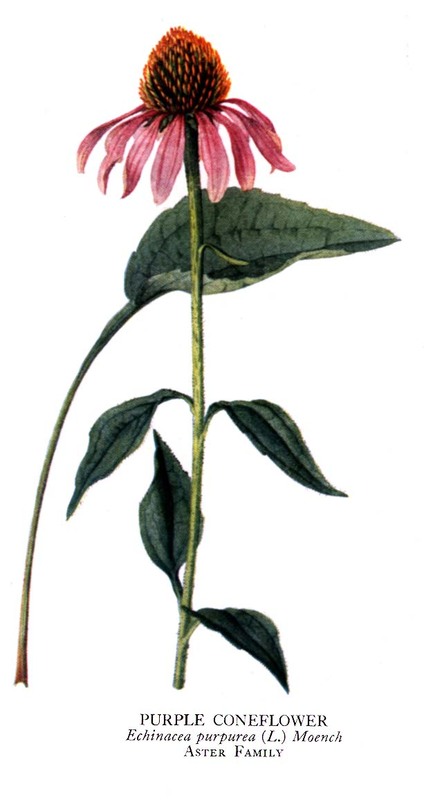 Although there are nine species of Echinacea, Shannon required only E. angustifolia, E. purpura and E. pallida as these were the ones in most Echinacea health products. These look the same. One lone cone flower rises on a tall rough-hairy stem on a dark green base of lance-shaped leaves. The cone is generally brown with drooping florets. These range in colour from whitish-pink to a reddish-purple. My strategy was to point out any pink colour among the grassland plants on the side of the road. We became very good at spotting Echinacea at a distance of 1000 metres while travelling at full speed. The car full of alcohol was our rental packed with camp gear, digging tools and containers of ethyl alcohol, the preservative for the harvested Echinacea. Shannon packed a lot of these in anticipation of a successful trip. Every day was the same: Drive until we saw a clump of Echinacea, get out of the car, dig for the plant, place the plants in the containers with alcohol, label the container and record the GPS location. Then we would be off, barely taking in the scene around us, except the first few times, at the distant grazing herds of cattle, sometimes a small herd of bison or the lone pronghorn. The trunk smelled of alcohol. Then the car interior. We crossed the border back into Canada with trepidation, as we were taking the crossing used by drug traffickers. It was our lucky day: The border guard looked at the dozen permits and licences to collect and transport our precious Echinacea, glanced at the pile of opaque containers in the back seat, then waved us on. Shannon and I had a great time on her road trip. Curiously, I have never used tinctures of Echinacea since then. I wonder if it’s the smell of the alcohol. “Uña de gato,” the shaman said as he pointed into the jungle. I peered into the dripping greenery. His son, Pedro, one of our interpreters on this walk said "gato," then “cat," then made meowing sounds and waved his hand towards me in a claw shape. As Francisco repeated uña de gato, I saw it. I had seen this plant before but only as thin slabs of wood and twig pieces as I readied to grind them down to extraction size. Uña de gato was not much to look at; in fact, except for the barely visible claw-shaped thorns amongst the greenery, this vine was ordinary, its roots somewhere unseen and the growing end winding somewhere into the distant forest top. However, to see this plant, I had to travel south to Belize, to hike along a little-used path and stumble along animal trails in the hot and humid rainforest, soaked by a tropical rain that stopped as suddenly as it started. The other botanists and agronomists on this medicinal walk provided useful facts like how the tropical rainforests have the greatest genetic and biological diversity of all terrestrial populations. I was certain of this as we walked with the ever-present clouds of hungry mosquitoes and vigilant for venomous spiders, ants, and snakes not seen in our Canadian forests. The claw-shaped thorns give the name Cat’s claw or uña de gato (Uncaria tomentosa) to this vine. The leaves are no greener nor is the bark darker brown than other plants in that tropical rainforest. Yet it is a special plant because some time in the distant past someone made a medicine from it. Today, this plant is still used traditionally by the indigenous peoples of the Central and South Americas. Francisco, the local healer, the shaman that the Que'chi Maya of the Toledo District in Belize turn to first for their health needs, uses this vine to treat arthritis, digestive problems and women’s hormonal imbalance. Around the world, where no one has ever seen the actual living plant, the plant extract is used to boost the immune system to fight a cold and to alleviate arthritic pain. Early studies suggest that this plant may aid in the fight against cancer. That afternoon, looking at uña de gato dripping with the last raindrops in the tropical sun, I connected with the Mayan past. Through the shaman and his tradition, the phytochemist (me), and our science, we build upon knowledge to develop medicines for our time.